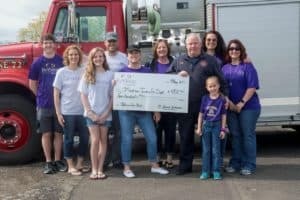 ReVision Gives Back makes donation to the Madison Township Fire Department. Through the ReVision Gives Back program, ReVision LASIK and Cataract Surgery is proud to make a donation to the Madison Township Fire Department located in Richland County. The department’s first responders provide fire, emergency medical and special hazards services to the community. ReVision LASIK and Cataract Surgery was honored to present Madison Township Fire with a check in the amount of $400 while volunteering at the department’s annual Pancake Breakfast. Several community members visited the fire station during this fun morning event to meet their local heroes and enjoy a delicious breakfast prepared and served by firefighters and the ReVision team. ReVision LASIK and Cataract Surgery thanks the brave first responders at Madison Township Fire and departments across the country for their service. Because clear vision is vital to performing life-saving duties in emergency situations, ReVision is honored to offer a First Responder special rate for LASIK procedures. In addition to improving quality of life, LASIK enhances job safety and performance by eliminating the need for glasses or contact lenses. Firefighters, EMT, law enforcement, military personnel and their immediate families are invited to take advantage of the special First Responder rate. Schedule a personal consultation to learn more about custom LASIK vision corrections options and the First Responder Program.